Hydroponics, by definition, is a method of growing plants in a water based, nutrient rich solution. Hydroponics does not use soil, instead the root system is supported using an inert medium such as perlite, rockwool, clay pellets, peat moss, or vermiculite. The basic premise behind hydroponics is to allow the plants roots to come in direct contact with the nutrient solution, while also having access to oxygen, which is essential for proper growth. I highly recommend reading through this guide and learning as much as you can about hydroponics before you start your garden. Even if you don’t plan on growing with hydroponics, you can still learn a lot about what plants need in their various stages of growth by reading about the basics of hydroponics. Growing with hydroponics comes with many advantages, the biggest of which is a greatly increased rate of growth in your plants. With the proper setup, your plants will mature up to 25% faster and produce up to 30% more than the same plants grown in soil. Your plants will grow bigger and faster because they will not have to work as hard to obtain nutrients. Even a small root system will provide the plant exactly what it needs, so the plant will focus more on growing upstairs instead of expanding the root system downstairs. All of this is possible through careful control of your nutrient solution and pH levels. A hydroponic system will also use less water than soil based plants because the system is enclosed, which results in less evaporation. Believe it or not, hydroponics is better for the environment because it reduces waste and pollution from soil runoff. Despite the fact that a hydroponics system has so many advantages, there are actually a few disadvantages as well. The biggest factor for most people is that a quality hydroponics system of any size will cost more than its soil counterpart. Then again, dirt isn’t exactly expensive and you get what you pay for. A large scale hydroponics system can take a lot of time to setup if you aren’t the most experienced grower. Plus, managing your hydroponics system will take a lot of time as well. You will have to monitor and balance your pH and nutrient levels on a daily basis. The greatest risk with a hydroponics system is that something like a pump failure can kill off your plants within hours depending on the size of your system. They can die quickly because the growing medium can’t store water like soil can, so the plants are dependent on a fresh supply of water. The cool thing about hydroponics is that there are many different types of hydroponics systems available. Some of the best hydroponic systems on the market combine different types of hydroponics into one hybrid hydroponic system. Hydroponics is unique in that there are multiple techniques you can use to get the nutrient solution to your plants. Deepwater Culture (DWC), also known as the reservoir method, is by far the easiest method for growing plants with hydroponics. In a Deepwater Culture hydroponic system, the roots are suspended in a nutrient solution. An aquarium air pump oxygenates the nutrient solution, this keeps the roots of the plants from drowning. Remember to prevent light from penetrating your system, as this can cause algae to grow. This will wreak havoc on your system. The primary benefit to using a Deepwater Culture system is that there are no drip or spray emitters to clog. This makes DWC an excellent choice for organic hydroponics, as hydroponics systems that use organic nutrients are more prone to clogs. Nutrient Film Techinque, or NFT, is a type of hydroponic system where a continous flow of nutrient solution runs over the plants roots. This type of solution is on a slight tilt so that the nutrient solution will flow with the force of gravity. This type of system works very well because the roots of a plant absorb more oxygen from the air than from the nutrient solution itself. Since only the tips of the roots come in contact with the nutrient solution, the plant is able to get more oxygen which fascilitates a faster rate of growth. 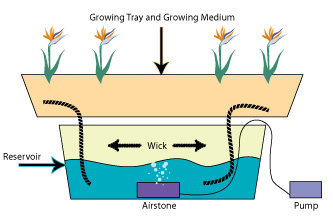 Aeroponics is a hydroponics method by which the roots are misted with a nutrient solution while suspended in the air. There are two primary methods to get the solution to the exposed roots. The first method involves a fine spray nozzle to mist the roots. The second method uses what’s called a pond fogger. If you decide to use a pond fogger then make sure you use a Teflon coated disc, as this will reduce the amount of maintenance required. You may have heard of the AeroGarden, which is a commercialized aeroponics system. 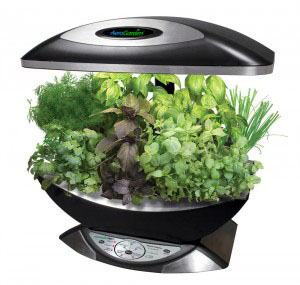 The AeroGarden is an excellent entry point to aeroponics. It’s a turn-key system that requires little setup. It also comes with great support and supplies to get you started. 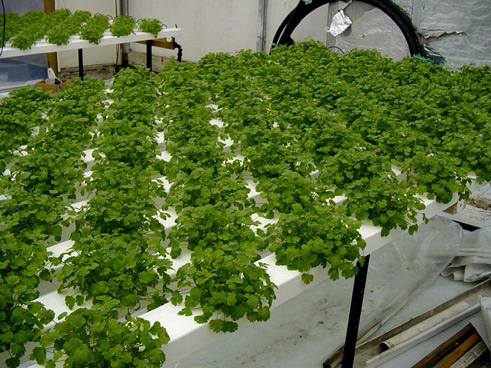 Wicking is one of the easiest and lowest costing methods of hydroponics. The concept behind wicking is that you have a material, such as cotton, that is surrounded by a growing medium with one end of the wick material placed in the nutrient solution. The solution is then wicked to the roots of the plant. This system can be simplified by removing the wick material all together and just using a medium that has the ability to wick nutrients to the roots. This works by suspending the bottom of your medium directly in the solution. We recommend using a medium such as perlite or vermiculite. Avoid using mediums such as Rockwool, coconut coir, or peat moss because they may absorb too much of your nutrient solution which can suffocate the plant. 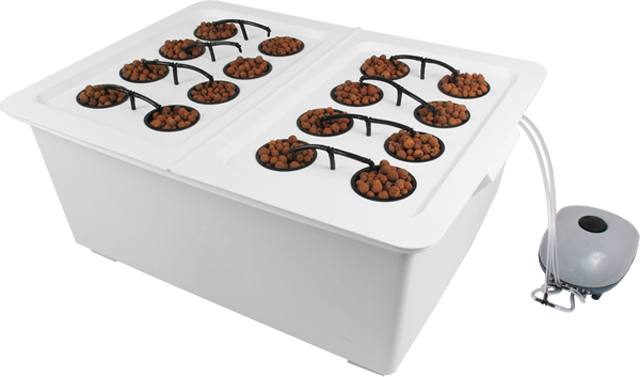 An ebb & flow hydroponics system, also known as a flood and drain system, is a great system for growing plants with hydroponics. This type of system functions by flooding the growing area with the nutrient solution at specific intervals. The nutrient solution then slowly drains back into the reservoir. The pump is hooked to a timer, so the process repeats itself at specific intervals so that your plants get the desired amount of nutrients. 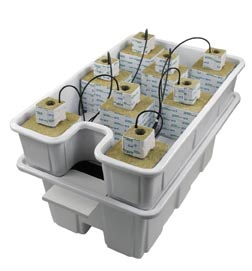 An ebb & flow hydroponics system is ideal for plants that are accustomed to periods of dryness. Certain plants flourish when they go through a slight dry period because it causes the root system to grow larger in search of moisture. As the root system grows larger the plant grows faster because it can absorb more nutrients. 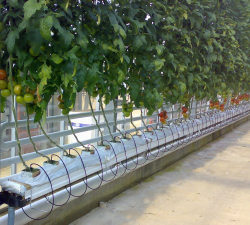 A hydroponic drip system is rather simple. 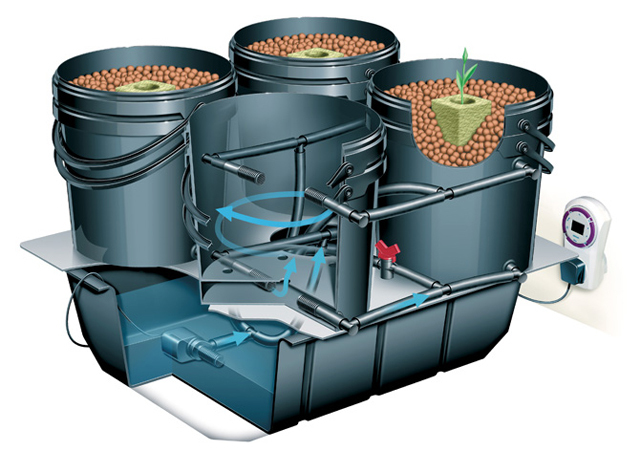 A drip system works by providing a slow feed of nutrient solution to the hydroponics medium. We recommend using a slow draining medium, such as Rockwool, coconut coir, or peat moss. You can also use a faster draining medium, although you will have to use a faster dripping emitter. The downside to a system like this is that the drippers / emitter are famous for clogging. We prefer not to use drip systems, but it can be an effective method for growing if you can avoid the clogs that plague this type of system. The reason the system gets clogged is because particles from nutrients that build up in the emitter. Systems that use organic nutrients are more likely to have this kind of issue. We highly recommend changing the nutrient solution in your reservoir every two to three weeks. Keep the water temperature in your reservoir between 65 and 75 degrees. You can maintain the water temperature by using a water heater or a water chiller. An air pump with an air stone connected by flexible tubing can help increase circulation and keep your nutrient solution oxygenated. If your plant doesn’t look healthy, either discolored or distorted, then the first thing you should check and adjust is the pH. If you determine that the pH is not the problem then flush your system with a solution like Clearex. We recommend following the feeding cycle provided by the manufacturer of your nutrients. Flush, clean, and sterilize your entire system after you finish a growing cycle. Drain your reservoir and remove any debris, then run your entire system for about a day with a mix of non-chlorine bleach and water. Use 1/8th of a cup of non-chlorine bleach for every gallon of water. Then drain your system and flush it thoroughly with clean water to remove any excess bleach. Hydroponics is an excellent choice for all types of growers. It is a great choice because it gives you the ability to meticulously control the variables that effect how well your plants grow. A fine tuned hydroponic system can easily surpass a soil based system in plant quality and amount of produce yielded. If you want to grow the biggest, juiciest, yummiest plants you can possible imagine, then hydroponics is the right choice for you. It may seem intimidating at first with all the equipment and work involved, but it will all seem simple enough once you get the hang of the basics. Start small, keep it simple, and your hydroponic system will never cease to amaze!